He traveled with his friend Peter James Bailey 2, also a lawyer from Logan County and himself only 23 years old. Both men enlisted in the Volunteer Auxiliary Corps of Texas 3 on January 14, 1836, at Nacogdoches, as did B. Archer M. Thomas 4, William Fauntleroy 5, and Joseph G. Washington 6, all of whom were from Logan County, Kentucky. Another Kentuckian, Davy Crockett 7 8 9, also joined the volunteers there as did Micajah Autry 10 of Tennessee and several others from Pennsylvania and Virginia and they departed there for San Antonio de Béxar and the Alamo. They arrived after February 11 and became members of the Tennessee Mounted Volunteers, commanded by William B. Harrison 11. From "The Quarterly of the Texas State Historical Association" 12 which lists the names of 13 men on the muster roll. Know all men by these presents: That I have this day voluntarily enlisted myself in the Volunteer Auxiliary Corps, for and during the term of six months. And I do solemnly swear that I will bear true allegiance to the provisional Government of Texas, or any future Government that may be hereafter declared, and that I will serve her honestly and faithfully against all her enemies whatsoever and observe and obey the orders of the Governor of Texas, the orders and decrees of the present and future authorities and the orders of the officers appointed over me according to the rules and regulations for the government of the Armies of Texas. "So help me God." H. S. Kimble 31 Tennessee. M. Authey [Autry] 43 Tennessee. J. P. Bailey 24 Kentucky. Daniel W. Cloud 21 Kentucky. W. J. Lewis 28 Pennsylvania. Wm. H. Furtleroy [Fauntleroy] 22 Kentucky. B. M. Thomas 18 Tennessee. R. L. Stockton 18 Virginia. J. E. Massie 24 Tennessee. John P. Raynolds 29 Tennessee. The above sworn to and subscribed before me, this 14th January, 1836. 1st Judge of the Municipality of Nacogdoches. It is not known if any of the men had horses, but it is believed that some in their company traveled on foot the 350 miles to San Antonio. 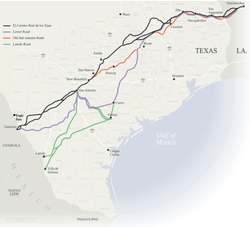 The winter of 1835-1836 was especially cold and the rain made the road muddy and almost impassable at times (a diary records a February "Texas Blue Norther"). 16 (Records of the Mexican army, which was south of the Rio Grande, record that a norther struck February 13 and that both men and horses died from the cold.) Some of the band of volunteers apparently died on the journey, as three of the names from the muster roll are not listed among the dead at the Alamo. 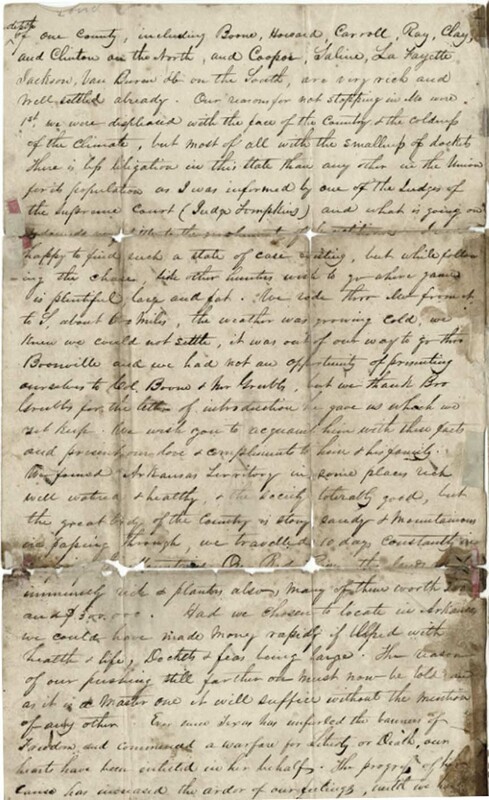 See the notes from the The Southwestern Historical Quarterly on the page "Micajah Autry's Letter". So much has changed, and so much has been lost. Who among us today can understand the clarity with which men like Daniel and his friends saw moral and ethical issues or their fiery zeal for the freedom and independence of all mankind? How many of us would put a professional career on hold and commit our very lives to fight for the right of fellow countrymen to be free? The United States of America was still in its infancy when this letter was written, only 60 years having elapsed since the Declaration of Independence was signed. The subsequent years of fighting and strife were fresh in the minds of every adult American, the War of 1812 having ended only 20 years previous. Their continuing struggles for survival prevented them taking those newfound freedoms for granted. Would that we could find men today of such virtue and courage. 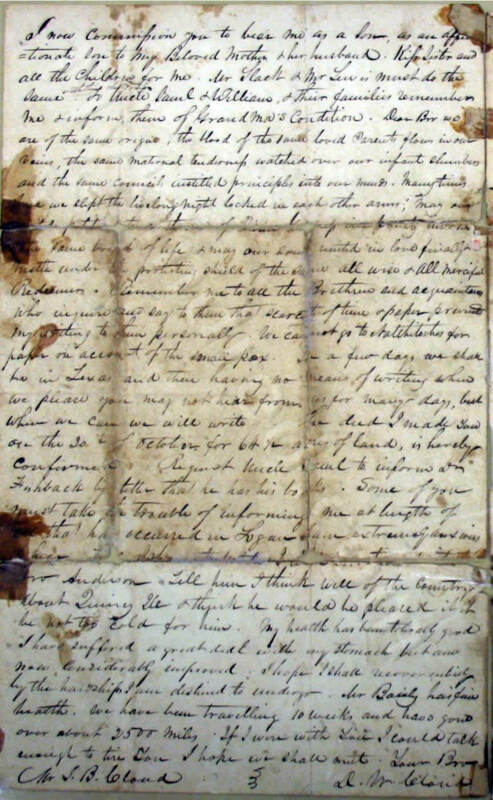 Listen to a recording of Daniel Cloud's letter. A long time has elapsed since we parted and long before this period I expected to write to you but continual traveling and employment have prevented. After leaving Uncle Samuel's in Missouri which we did on the 29th of November, we journeyed south. I left the family well except Grandma (his uncle Samuel's mother Elizabeth Marrs Owen who d. Mar. 17, 1836), who was extremely ill. I have no idea that she yet lives. I left upwards of $30.00 dollars with her besides the $10 sent her by Uncle William (her son William Owens), which made between forty and fifty, which I deem sufficient in the event of life or death. She had blankets and every kind of comfortable clothing and all that Aunt could do to alleviate her suffering was done. We set off before Aunt Rice and her family arrived but were informed that they had good health and enough to eat and wear. Now you wish me to say something of the country through which we have traveled, viz. Illinois, Missouri, Arkansas and Louisiana. The soil of Illinois, north of 38° is the best I ever saw and from all that I can learn, the best body of land on earth of the same extent. The water is abundant and may be called good, many parts I regard as healthy, and the ridgeland between Illinois and Mississippi River, I believe to be as healthful as the Alleghany Mountains. Yankees, Kentuckians, and Ohioans, etc. are filling up the state with a rapidity unparalleled in the history of the West. I saw as fine farms, as good houses, barns, wagons, ploughs, horses, men, women and children, beds and furniture in Illinois as I ever saw in Kentucky. I view this state at no distant day far in advance of any western state except Ohio. The reasons which induced us to travel on, were briefly these: 1st our curiosity was unsatisfied; 2, law dockets were not large, fees low and Yankee lawyers numerous, 3, the coldness of the climate. Missouri, like Illinois, has too many prairies and unlike her, has very poor prairies. West of 15°, west longitude from Washington City, the lands on both sides of the Missouri river about the 2 depth of one county -- including Boone, Howard, Carroll, Ray, Clay and Clinton on the North, and Cooper, Saline, LaFayette, Jackson, Van Buren, etc. on the South, are very rich and well settled already. Our reason for not stopping in Missouri were first, we were disappointed in the face of the country and the coldness of the climate, but most of all, the smallness of the docket. There is less litigation in this state than in any other in the union for its population, as I was informed by one of the judges of the supreme court (Judge Tompkins 20) and what is going on redounds very little to the emolument of the practitioners. I was happy to find such a state of case existing, but while following the chase, like other hunters, wish to go where game is plentiful, fat and large. We rode through Mo. from north to south, about six hundred miles, the weather was growing cold, we knew we could not settle. 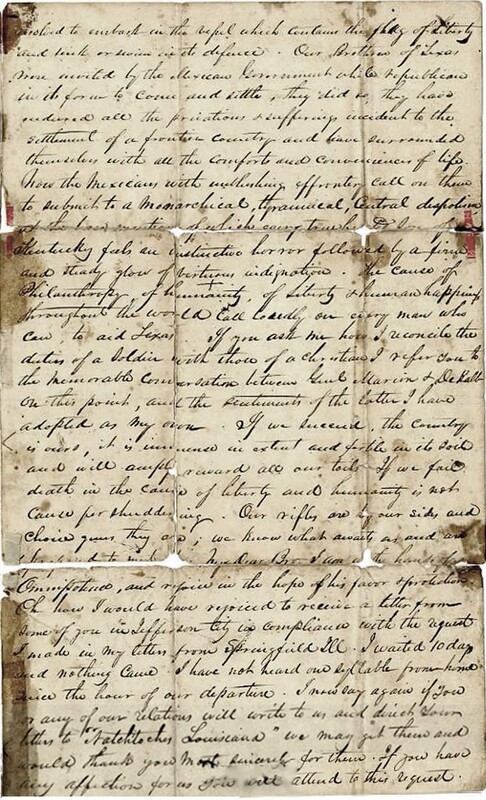 It was out of our way to go by Boonville and we had not an opportunity of presenting ourselves to Col. Boone 21 and Mr. Grubbs, but we thank Brother Grubbs for the letter of introduction which he gave us and which we yet keep. We wish you to acquaint him with these facts and to present our love and compliments to him and his family. We found Ark. territory in some places rich, well watered and healthy and society tolerably good, but the great body of the country is stony, sandy and mountainous. In passing through, we traveled ten days constantly in crossing the mountains. On Red River the lands were immensely rich, and planters also, many of them worth 200 and 300 thousand dollars. Had we chosen to locate in Arkansas, we could have made money rapidly if blessed with health and life; dockets and fees being large. The reason for our pushing still further on must now be told, and as it is a master one, it will suffice without the mention of any other one. Ever since Texas has unfurled the Banner of Freedom, and commenced a warfare for liberty or death, our hearts have been enlisted in her behalf. The progress of her cause has increased the ardor of our feeling until we have 3 resolved to embark in the vessel which contains the Flag of Liberty and sink or swim in its defense. 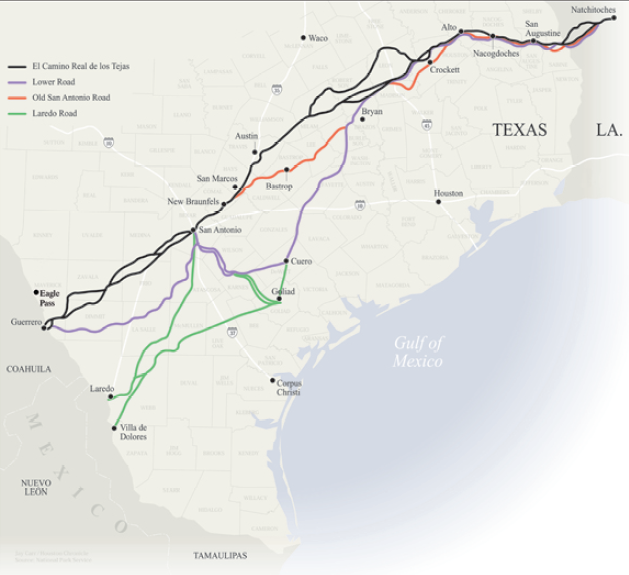 Our brethren of Texas were invited by the Mexican Government while Republican in its form to come and settle; they did so; they have endured all the privations and suffering incident to the settlement of a frontier country and have surrounded themselves with the comforts and conveniences of life. 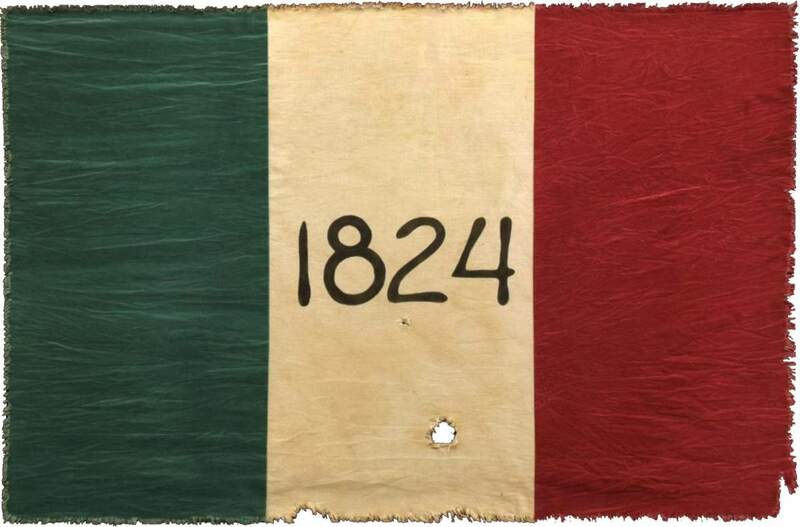 Now the Mexicans with unblushing effrontery, call on them to submit to a Monarchical, Tyranical central despotism, at the bare mention of which every true-hearted son of Kentucky feels an instinctive horror, followed by a firm and steady glow of virtuous indignation. The cause of Philanthropy, of Humanity, of Liberty and human happiness throughout the world calls loudly on every man who can to aid Texas. If you ask me how I can reconcile the duties of a soldier with those of a Christian, I refer you to the memorable conversation between Generals Marion 22 and DeKalb 23 on this point, and the sentiments of the latter I have adopted as my own. If we succeed, the Country is ours. It is immense in extent, and fertile in its soil, and will amply reward all our toils. If we fail, death in the cause of Liberty and humanity is not cause for shuddering. Our rifles are by our sides, and choice guns they are. We know what awaits us and are prepared to meet it. My dear Brother, I am in the hands of Omnipotence and rejoice in the hope of his favor and protection. Oh how I would have rejoiced to receive a letter from some of you in Jefferson City in compliance with the request I made in my letter from Springfield, Ill. I waited 10 days and nothing came. I have not heard one syllable from home since the hour of our departure. I now say again that if you or any of our relatives will write to us and direct your letters to Natchitoches, La., we may get them, and would thank you most sincerely for them. If you have any affection for me you will attend to this request. 4 I now commission you to bear me as a son -- as an affectionate son, to my beloved Mother and her husband. Kiss sister and all the children for me. Mr. Slack and Mr. Lewis must do the same with their children. To Uncle Samuel and William and their families, remember me and inform them of Grandma's condition. Dear Brother, we are of the same origin, the blood of the same parents flows through our veins, and the same maternal tenderness watched over our infant slumbers, and the same councils instilled principles into our minds. Many times we have slept the livelong night locked in each other's arms. May our united petitions to a throne of divine grace invoke the same bread of life and may our souls united in love, finally nestle under the protecting shield of the same all-wise and all-merciful redeemer. Remember me to all the Brethern and acquaintances who inquire and say to them that scarsity of time and paper prevent my writing to them personally. We cannot go to Natchitoches for paper on account of Small Pox. In a few days we shall be in Texas and then having no means of writing when we please. You may not hear from us for many days, but when we can we will write. The deed I made you on the 20th of October for 64-1/2 acres of land, is hereby confirmed. Request Uncle Samuel to inform Dr. Fishback 24 by letter that he has his books. Some of you must take the trouble of informing me at length of all that has occurred in Logan. I am extremely anxious to hear. Tell Brother Isham to write. I will some time write to Brother Anderson, tell him I think well of the country about Quincy, Ill. I think he will be pleased if not too cold for him. My health has been tolerably good. I have suffered a great deal with my stomach but am now considerably improved. I hope I shall recover entirely the hardships I am destined to undergo. Bailey 25 has fine health. We have been traveling 10 weeks and have gone over about 2500 miles. 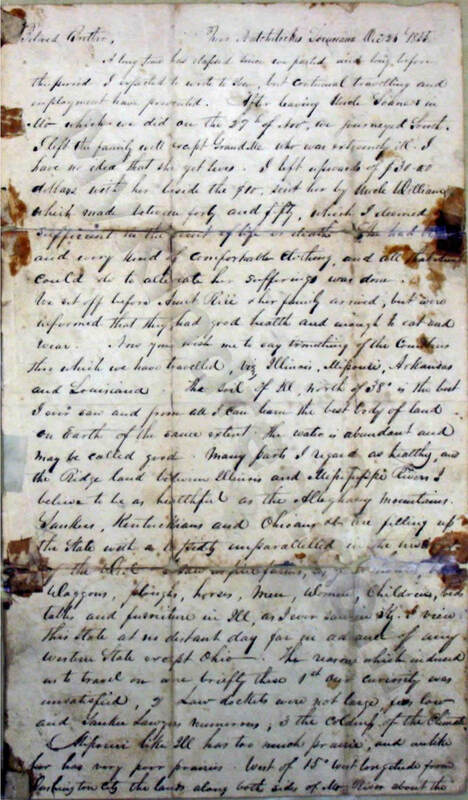 The above letter was written to Daniel's brother John B. Cloud who was living in Logan Co., Ky. His mother, the former Nancy Owen, had remarried William Chastain after her first husband (Daniel's father) Daniel Cloud died Jan. 25, 1818. "Bailey, Peter James" Handbook of Texas Online. Peter James Bailey was a friend of Daniel's, also a lawyer from Kentucky, and he too died at the Siege of the Alamo. 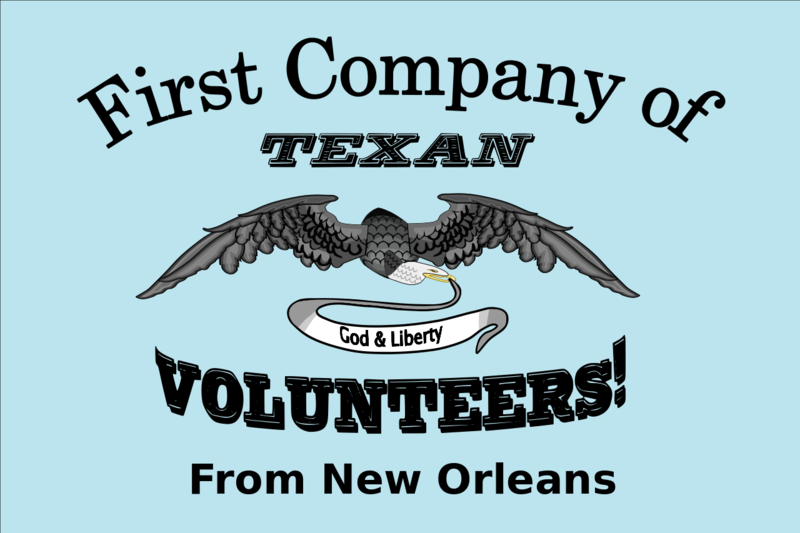 "Volunteer Auxiliary Corps" Wikipedia: Texian Army – Wikipedia: Army of the Republic of Texas – The Laws of Texas 1822-1897; pub. 1898 The Volunteer Auxiliary Corps was created to accommodate recent arrivals from the Unites States and citizens who didn't want to belong to a more formal military unit. "Thomas, B. Archer M." Handbook of Texas Online. "Fauntleroy, William" Handbook of Texas Online. "Washington, Joseph G." Handbook of Texas Online. Hoyt, Edwin P., The Alamo: An Illustrated History (Rowman & Littlefield, 2001), p. 72. "Autry, Micajah" Woodson Research Center - Fondren Library - Rice University: Micajah Autry 1793-1836. "Harrison, William B." Handbook of Texas Online. Eugene Campbell Barker & Herbert Eugene Bolton for the Texas Historical Association The Southwestern Historical Quarterly; The Quarterly of the Texas Historical Association, 1911, Vol. 14, p. 320-321. "Davy Crockett's oath of allegiance" Handbook of Texas Online – David Crockett in Texas; Myths & Legends of the Texas Revolution – "Killing Davy Crockett". "Gaines Ferry" Handbook of Texas Online. "Tompkins, George O." Wikipedia. Judge George O. Tompkins was a Justice of the Missouri Supreme Court from 1824 to 1845. "Boone, Nathan" Wikipedia. Col. Nathan Boone was the youngest son of Daniel Boone and served in the War of 1812. "Marion, Francis" Crawford, Amy; Smithsonian.com. smithsonianmag.com Revolutionary Soldier Genl. Francis Marion, known as "The Swamp Fox". "DeKalb, Baron Johan" ushistory.org. Revolutionary Soldier Genl. Baron Johan DeKalb. "Fishback, James" therestorationmovement.com. This was probably the Rev. Dr. James Fishback, a physician, lawyer and professor as well as a Baptist and then Church of Christ minister.